The 3rd edition of "Wainwright Guides" is now coming off the presses, a volume at a time, brought up to date by Clive Hutchby. The publisher has called it the "Walker's Edition", although what they thought previous editions were is beyond me. Why not simply call it the Third Edition? Anyway, although I haven't used it yet for myself out on the fells, if Clive Hutchby's previous work is anything to go by this fresh version, with both updates and some additional material, is likely to continue the popularity of the series. Alfred Wainwright is still the unsurpassed guide to the Lake District Fells. To close on a practical point, some who have used it say that the flexible water-resistant cover is an advantage when out and about. 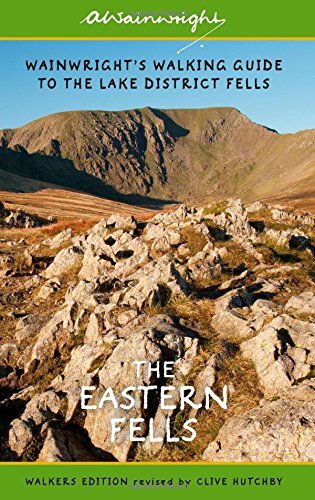 The "Eastern Fells" volume of this edition covers exactly the same area as earlier ones. Starting at Ambleside and moving north, Book 1 includes the fells to the east of the River Rothay, Rydal Water, Grasmere, Dunmail Raise and Thirlmere as far north as the A66 and extending eastwards as far as Ullswater and Kirkstone Pass. Helvellyn, Fairfield, Dollywagon Pike, High Hartsop Dodd, Glenridding Dodd and Sheffield Pike are just a few of the peaks in the main body of this area. To its northeast three fells, Great Mell and Little Mell Fells plus Gowbarrow Fell top off the selection. Other Editions of the "Wainwright Guides"
In the "Related Products" section at the foot of this page you will find a link to the 2nd edition copy of this volume, which was revised by Chris Jesty. While it may seem strange to be promoting what could be seen as an "out of date" edition the fact is that the 2nd edition is still in practical use by many walkers, plus a lot of people like to complete a set of the same edition in uniform binding for their bookshelves. If you already have some 2nd edition copies why not have both, the hard-bound Chris Jesty 2nd edition for the shelf and the flexible bound 3rd edition for the rucksack or pocket?